Call us crazy, call us old fashioned. Whenever we have the chance to work with suppliers that are based in the United States, and provide the same level of service, quality, and price as companies located elsewhere, we choose to work with the Americans. Heck, our company founder even drives an American car! (Chevy Impala). Our point? 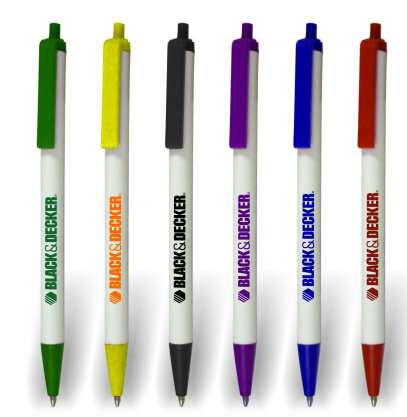 This colored-trim click pen can hold its own against any of its foreign counterparts. So why would you buy anywhere else? On top of it all, they are UNION PRINTED and we can prove it! Production time: Please allow 10 business days from proof approval as these are custom items. We proof all orders by email at no cost to you. FREE SHIPPING for a limited time! 2019 Advertising Specialties by AdSpecialtyProducts.com All Rights Reserved.